Welcome to ICF New Mexico, a charter chapter of the International Coach Federation (ICF). Deepen connections with our community through a new ICF program. promoting inclusive and quality education and lifelong learning. to accelerate progress towards their goals. We are professional coaches who uphold the standards and ethics set forth by ICF. Our members serve organizations and individuals as executive, leadership, career, business, and life coaches. All are actively engaged in advancing personal and professional development. Many of our members hold ICF professional credentials. ICF New Mexico serves coaches, clients and the community in the state of New Mexico and adjacent areas. 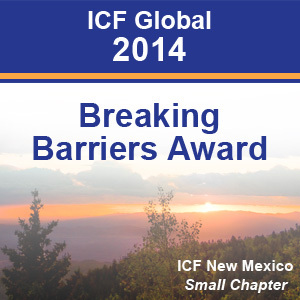 To contact ICF New Mexico, click here .